To successfully implement any data security initiative, it is important to know what data you have, how sensitive it is, where it is located and who has access to it. Data discovery and classification has achieved a new prominence, particularly as data takes new forms and is dispersed across a growing array of devices and off-premises locations. TITUS has been actively expanding its capabilities in the past few years. 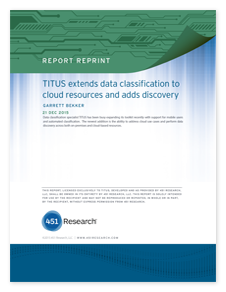 In this Market Insight report, 451 Research takes a look at the expanding portfolio of TITUS, and the latest product additions addressing cloud data security and data discovery.